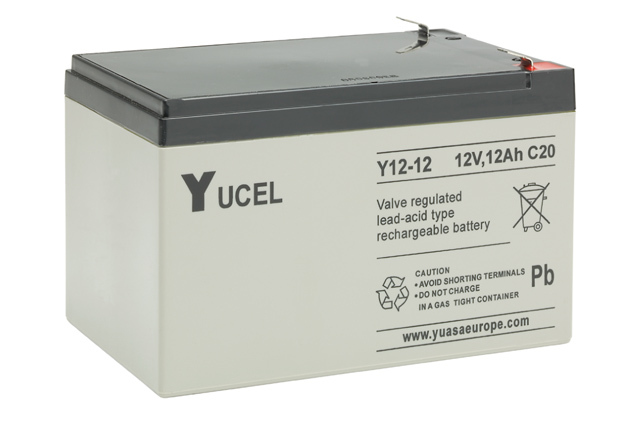 The Yuasa Yucel Y12-12 is a 12V 12Ah lead acid battery developed for use within general applications that require and independent and reliable battery source. Based on a universal box size, the Y12-12 has a case constructed from strong ABS plastic which is fully sealed to ensure no electrolyte can leak from either the case or terminals. 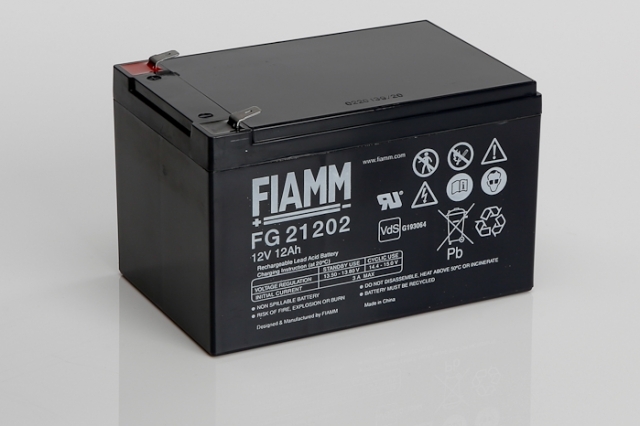 Due to this feature this battery can be used in various orientations, with exception to permanently inverted. The sealed case, convenient ‘no tool required’ faston terminals, and highly efficient gas recombination makes this battery virtually maintenance free when installed into systems with automated charging systems. 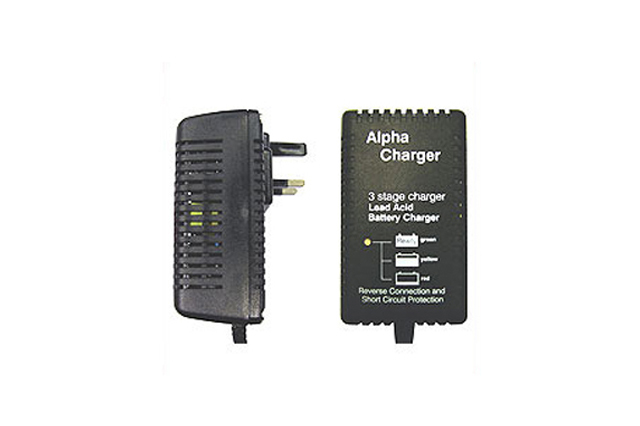 Should you require a separate charger please see the recommended charger shown at the bottom of this product page. In common with all of the Yuasa Yucel series, the Y12-12 utilises an electrolyte suspensions system which incorporates an absorbed glass mat (AGM) to ensure the maximum amount of electrolyte is retained evenly within the cells. This technology has been long proven in the field and provides high reliability in protecting critical power loads in the event of mains failure. As stockist of all Yuasa industrial battery solutions, Blue Box Batteries are best placed to provide technical support and advice as well as providing the most competitive pricing available. Call us today, we look forward to assisting you. Fitment Manufactured worldwide with universal box size fitments. Multipurpose Can be used in both float and cyclic applications. Certifications ISO 9001, ISO14001, ISO18001. Low Maintenance Sealed construction and internal recombination. Grids Lead calcium for extended life. Will this battery arrived fully charged? 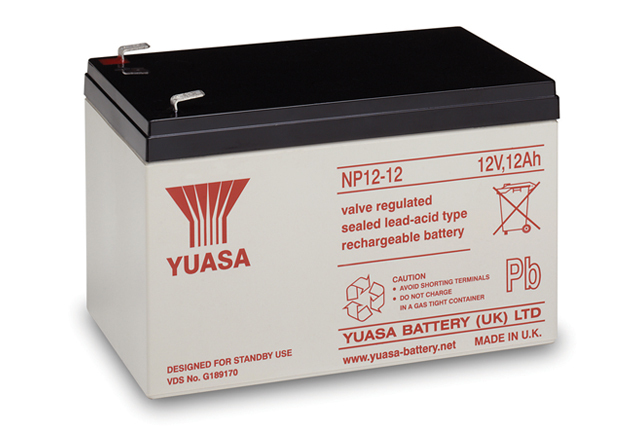 The Yuasa Y12-12 will be delivered in an approximate 90-95% state of charge, we do recommend charging prior to installation. Should you require, we do offer chargers to suit this product, the applicable charger for this battery (charging in single units) is shown as the bottom of this product page. Visitors by appointment only please. Copyright 2019 Blue Box Batteries Ltd.